This is a licence agreement where the owner can sub-license his car space currently not in his use, to someone else for a period of time. This agreement has been drawn for a property owner or tenant who has an existing licence to use a car park space, either specific or generally, but who is not presently able to use it and wishes to let it to someone else to generate an income (and perhaps offset a mortgage or rent). Using this agreement he or she can effectively sub-license his or her right to use that space to someone else. You may want this arrangement to last only a few weeks or for several months. It is best not to create a fixed term agreement, but rather grant permission on a rolling basis. A fixed term suggests the arrangement might be a tenancy, under which the tenant would have more rights to stay using it. If you let a car park space to a person who will use for personal, and not business, purposes, he or she is not protected by the Landlord and Tenant Act 1954. This is a simple agreement with a menu of “do’ s and don’ts” from which you can choose for your licensee. 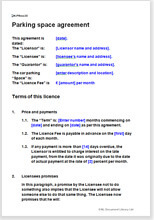 There is, of course, provision for the licensee to comply with the terms of your own licence document. If you are licensing a space you yourself own outright, use this agreement instead.